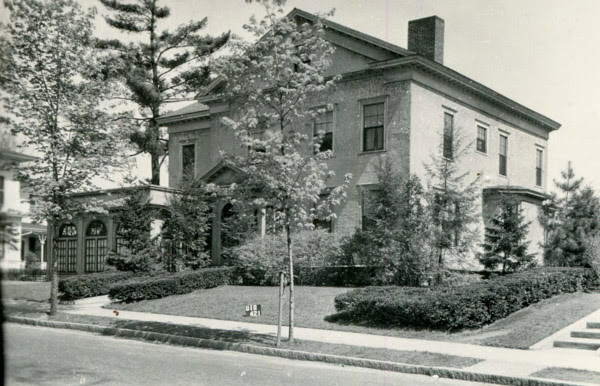 The house at 5 Ridgewood Terrace, at the corner of Union Street in Springfield, around 1938-1939. Image courtesy of the Springfield Preservation Trust. Albert W. Fulton was born in Iowa in 1859, but later moved to Chicago, where he worked as a reporter and commercial editor for the Chicago Tribune. However, he came to Springfield in 1893, and that same year he married his wife, Rena E. Day. Early in their marriage, they lived in a new house on Spruceland Avenue in the Forest Park neighborhood, but around 1909 they moved into this newly-completed, much larger house on Ridgewood Terrace. At the time, Fulton was the treasurer of the Phelps Publishing Company, a Springfield-based firm that published a variety of agricultural-related periodicals, including the New England Homestead, Farm and Home, American Agriculturalist, Orange Judd Farmer, and, perhaps most notably, Good Housekeeping. Albert and Rena had two daughters, Dorothy and Anna, and they lived here until about 1924, when they moved to a nearby house at 372 Union Street. Albert would eventually go on to become president of Phelps Publishing, and he lived in Springfield until his death in 1938. In the meantime, this house was sold to William S. Warriner, who was living here during the 1930 census, along with his wife Jennie. He was an insurance agent, but he was also involved in politics, having previously served as a city alderman and as a state legislator. Along with this, he was a veteran of the Spanish-American War, where he was badly wounded in Cuba, and he went on to serve for many years in the state militia, eventually attaining the rank of colonel. The Warriners were still living here when the first photo was taken in the late 1930s, but they moved out soon afterward, because by 1940 they were living nearby on Mulberry Street. The house was then sold to Raymond H. Kendrick, an Episcopal priest who was serving as canon of Christ Church Cathedral. He was native of Springfield, and the son of former mayor Edmund P. Kendrick, but after completing his education he served in a number of different churches, including in Albany, New Bedford, Boston, and North Andover, before finally returning to Springfield. 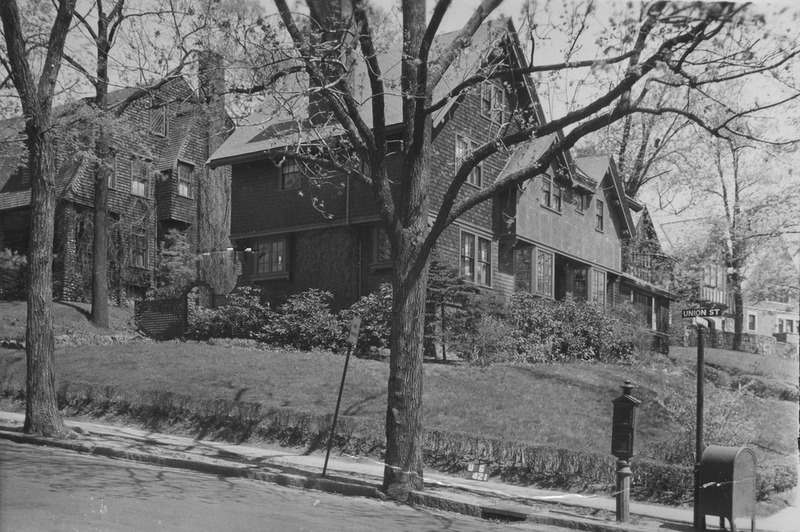 After purchasing this house on Ridgewood Terrace, he and his wife Sarah went on to live here for the rest of their lives, until her death in 1956 and his death in 1968. Nearly 80 years after the first photo was taken, very little has changed with the Ridgewood area. 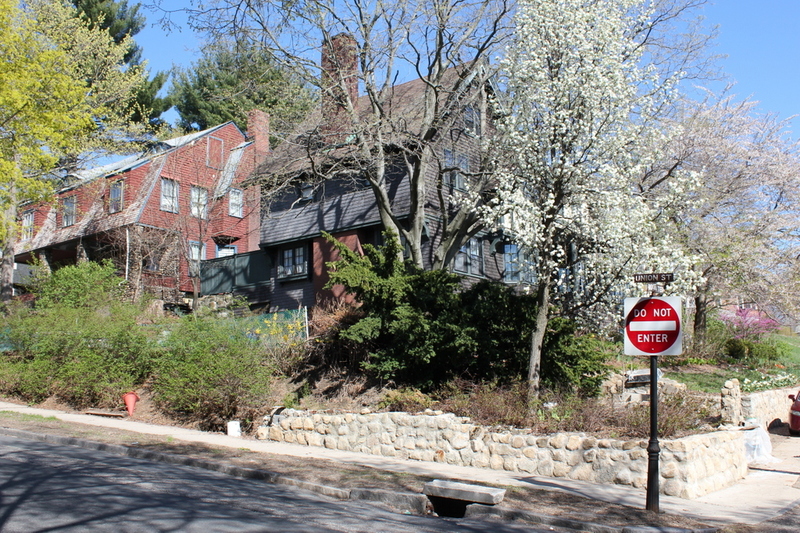 Developed at the turn of the 20th century with a number of upscale homes, this area between Union and Mulberry Streets has retained its original appearance, including here at the corner of Ridgewood Terrace and Union Street. Both this house and the neighboring house to the left at 351 Union are well-preserved, and they are now part of the city’s Ridgewood Local Historic District. 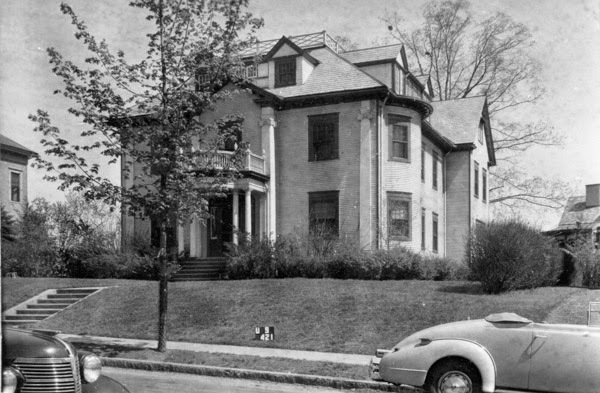 The house at 367 Union Street in Springfield, around 1938-1939. Image courtesy of the Springfield Preservation Trust. This house was built in 1899, and was part of the Ridgewood development, where a number of upscale homes were built on the former estate of Colonel James M. Thompson at the turn of the 20th century. It was purchased by Harry G. Fisk, who moved in with his newlywed wife Alice after their marriage in 1900. Fisk came from a prominent family of industrialists, including his uncle, George C. Fisk, who was the longtime president of Springfield’s Wason Manufacturing Company, one of the nation’s leading producers of railroad cars. George and his brother Noyes, Harry’s father, also started the Fisk Manufacturing Company, which became a major producer of soap, and Noyes served as the company’s clerk and treasurer. Harry was born in Springfield in 1873 and graduated from MIT in 1896. Three years later, he and his father Noyes started the Fisk Rubber Company, with Noyes as president and Harry as treasurer. From its factory in Chicopee Falls, the company would go on to become a major producer of tires, and was eventually acquired by Uniroyal. Aside from the tire company, though, Harry was involved in a number of other corporations. He succeeded his uncle as president of the Fisk Manufacturing Company, and he was also a director of several other companies, including Massachusetts Mutual. He and Alice had four children, one of whom died in infancy, and they lived in this house until 1911, when they purchased a nearby house at 111 Maple Street. Later in the 1910s, the house was sold to Douglas V. Wallace, the son of Forbes & Wallace co-founder Andrew Wallace. He grew up in his father’s house on Maple Street, but after his marriage to Mary Robinson in 1913 the couple moved into this house. Douglas worked for his father’s department store, eventually becoming vice president and treasurer of the company, and he and Mary had two children who grew up here. However, the family moved to Longmeadow in the late 1920s, where Douglas died in 1930 at the age of 44. By the 1930 census, the house was owned by Chester T. Neal, a patent lawyer who lived here with his wife Julia, their four children, and his mother Minnie. He and Julia were still living here when the first photo was taken at the end of the decade, and they would remain here until at least the mid-1940s. Since then, the exterior of the house has remained well-preserved, as have many of the other surrounding homes in the neighborhood. Because of this, the area now forms the city’s Ridgewood Local Historic District, and encompasses the turn-of-the-century development in between Union and Mulberry Streets. 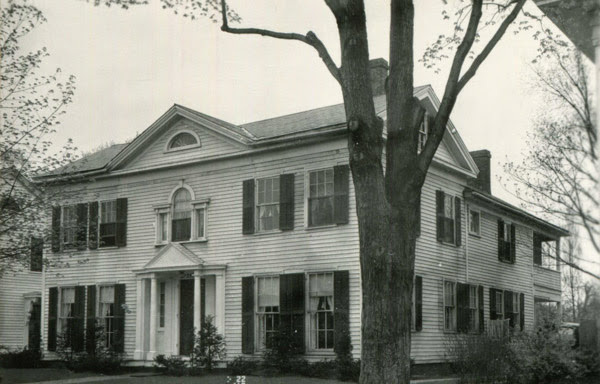 The house at 375 Union Street in Springfield, around 1938-1939. Image courtesy of the Springfield Preservation Trust. This house was built around 1901 for Charles H. Barrows, an attorney who lived here with his wife Jeannie and their daughter Eunice. Born in Springfield in 1853, he graduated from Harvard in 1876 and Harvard Law School two years later. He began his legal practice in the firm of Stearns & Knowlton, where he worked alongside Marcus P. Knowlton, a future chief justice of the state’s Supreme Judicial Court. Barrows also went on to work in state government, serving as assistant attorney general from 1881 to 1883, before returning to Springfield and opening his law practice. Aside from his work as a lawyer, Barrows was also involved in many local organizations, including serving as president of the Springfield YMCA and the president of the board of trustees for the International YMCA Training School, which was later renamed Springfield College. Other roles included president of the home for aged men, the Springfield Improvement Association, as well as the Horace Smith fund. He also wrote several books, including The Personality of Jesus (1906), The Poets and Poetry of Springfield in Massachusetts (1907), and The History of Springfield in Massachusetts for the Young (1909), as well as a few shorter works. Charles Barrows died in 1918, and Jeannie and Eunice lived in this house until the mid-1920s. By 1930, the house was owned by another lawyer, Clinton E. Bell. Originally from Southampton, he had attended Amherst College, graduating in the same class as future president Calvin Coolidge, and he went on to receive his law degree from Columbia. He practiced law in New York City for a few years, but then returned to Springfield in 1901, where he became a successful lawyer and a prominent citizen. Clinton Bell and his wife Charlotte were living here during the 1930 census, but he died four years later. Charlotte died in 1938, right around the time that the first photo was taken, and by the following year the house was the home of James and Lola Blunt. James was a vice president at the Springfield-based Monarch Life Insurance Company, but he only lived in this house for a few years before moving to Longmeadow in the early 1940s. At some point afterwards, the house appears to have been covered in asbestos shingles, and a small one-story addition was built on the right side. On the inside, it was converted into four apartments, but overall the exterior still retains much of its original appearance, and it now forms part of the city’s Ridgewood Local Historic District. The house at 393 Union Street in Springfield, around 1938-1939. Image courtesy of the Springfield Preservation Trust. Like the neighboring homes on either side of it, this house is among the oldest surviving buildings in Springfield. It dates back to around 1828, and was part of a small community that formed around the Methodist church, which was located at the corner of Union and Mulberry Streets. The early ownership of this house seems unclear, but by 1861 it was the home of Alexander Chapin, who was working at the U. S. Armory at the time. However, within a few years he was working for S. D. Burbank, “manufacturer of Gold and Silver Spectacles, Eye-glasses, Thimbles, and Solid Gold Rings.” He switched his occupation a few years later, though, because by 1865 he was selling boots and shoes with A. Chapin & Co.
Alexander Chapin died in 1866, but his wife Emily continued living here until her death a decade later. The house remained in the family, though, and during the 1880 census their daughters Frances E. Chapin and Maggie Montague were both living here, as were cousins William and Mary Bush, and Gordon Noble. At the time, Frances was 40 years old and unmarried, while Maggie was five years younger and a widow, having lost her husband William in 1865, just a year after their marriage. 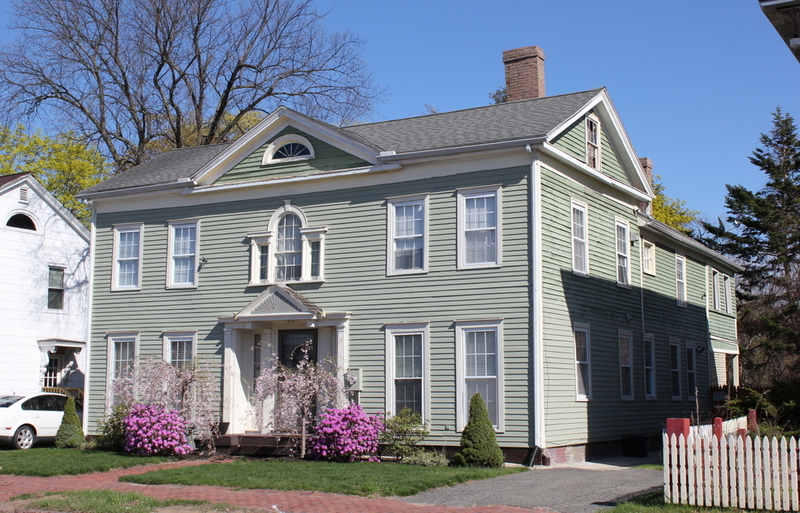 The family lived here into the early 1880s, but by 1883 it was the home of John S. Grant, a traveling salesman who lived here until around 1897, when he moved to Connecticut. Around 1900, the house was sold to Oswin B. Brockett, who lived here with his wife Augusta and their young son Ralph. Originally from Blandford, Massachusetts, Oswin came to Springfield in 1871 when he was in his mid-20s, and became the court messenger for the Hampden County Superior Court. He went on to hold this position for more than 50 years, and he lived in this house until his death in 1926. Augusta died four years later, but Ralph continued to live here for many more years. During the 1930s, he lived here with his aunt, Maria Knox, and he worked as vault custodian for the Springfield National Bank. They were here when the first photo was taken, and Ralph was apparently having the house repainted at the time, since the photo shows two painters at work on the front porch. Ralph was single for most of his life, but late in life he married his wife, Alma. They lived here together until his death in 1965, and Alma owned the property until she finally sold it in 1978, ending more than 75 years of ownership by the same family. At some point, probably while Ralph lived here, the exterior was covered in asbestos shingles, replacing the old clapboard from the first photo. However, aside from this the house has retained much of its original appearance, and it still stands as one of three adjacent homes that all date back to the 1820s. All three of these homes, along with others nearby, now form part of Springfield’s Ridgewood Local Historic District. 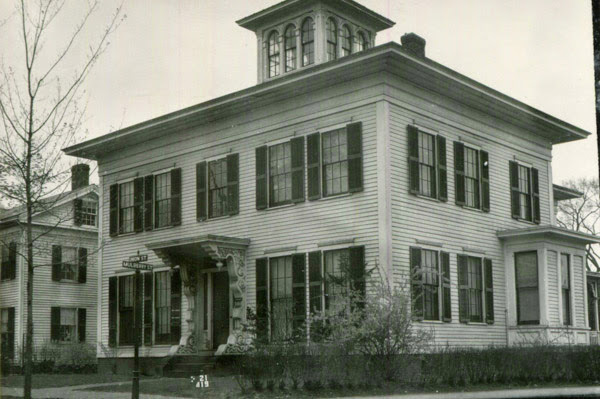 The house at 387 Union Street in Springfield, around 1938-1939. Image courtesy of the Springfield Preservation Trust. 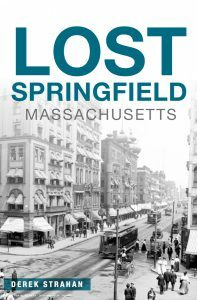 For its first two centuries, Springfield’s development was largely confined to the Main Street corridor in the present-day downtown area. 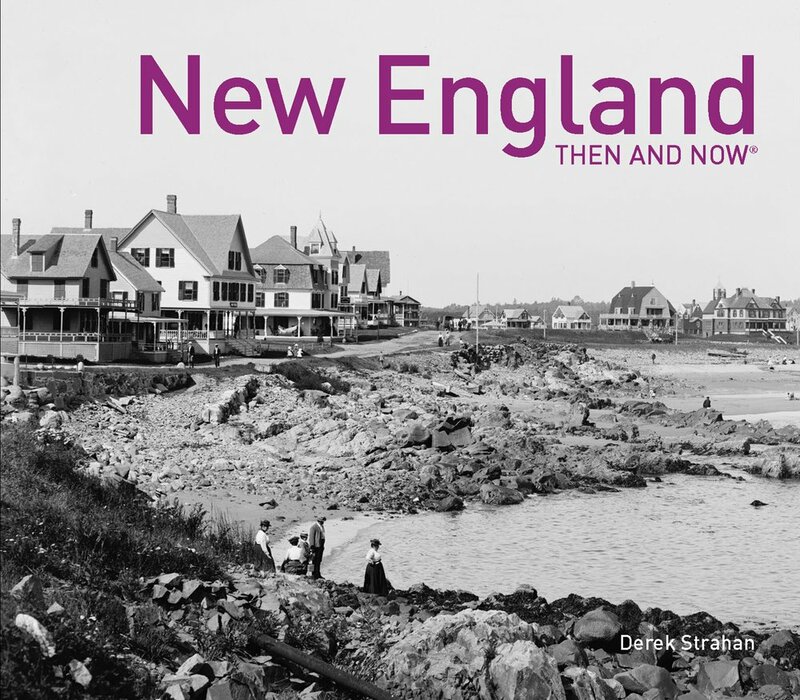 However, as Springfield began a period of rapid growth in the first half of the 19th century, the town began expanding eastward. With this growth came greater diversity in religious denominations, with new churches beginning to appear in a town that had long been dominated by the Congregational church. One of the first of these new religious groups was the Methodists, who built a church on the upper part of Union Street in 1823, at the corner of Mulberry Street. This part of Springfield was only sparsely settled at the time, and was situated on a hill above the downtown area. However, the Methodists built a small community here, complete with a cemetery that was later absorbed into the much larger Springfield Cemetery. Along with this, they also built houses here, several of which still stand on Union Street nearly 200 years later, including this one. This house is one of Springfield’s few surviving examples of Federal-style architecture, and according to city records it was built in 1828, which would make it among the oldest buildings in the city. The early history of its owners seems unclear, although an 1851 map shows both this and a neighboring house as being owned by Dennis Cook. A tin manufacturer, Cook appears to have lived in this house, along with his wife Sophronia and their children, George and Lucy. He died in 1853, but later city directories show Sophronia living here into the 1860s. At some point in the second half of the 19th century, the house was divided into a two-family home, with a variety of people living here over the years. Among them was Robert E. Cooper, a plumber who lived here in the late 1870s with his wife Julia and their sons Henry and George. Robert died in 1878, but the rest of the family was still living here in the 1880s, with George working at the Cheney Bigelow Wire Works while Henry worked at Smith & Wesson. During this same time, the other half of the house was the home of Albert Tomlinson, a dry goods store clerk who lived here with his wife Sarah and their son Henry. 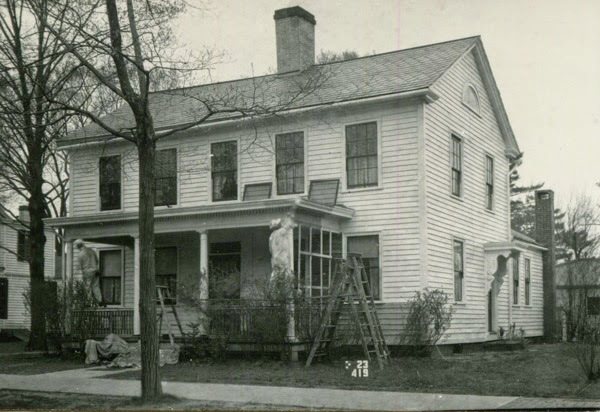 By 1910, the house was owned by Laura I. Mattoon, who rented one half of it to her father, William P. Mattoon. William was the son of William B. Mattoon, the railroad contractor who, among other things, was the namesake of Springfield’s Mattoon Street and the city of Mattoon, Illinois. The younger William was a real estate broker, and he was in his mid-60s when he moved into this house. He went on to live here for about six years, until his death in 1916. 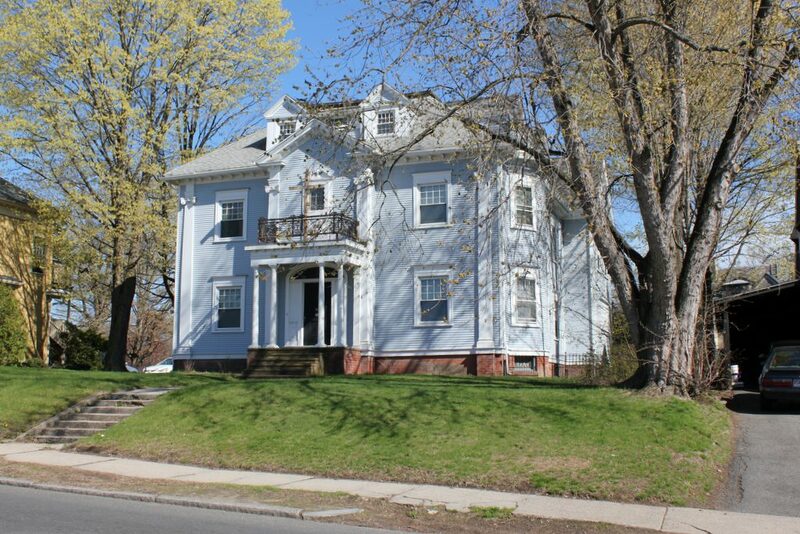 The house appears to have subsequently reverted to a single-family home, because by 1920 it was owned and occupied by Joseph E. Holmes, the treasurer of the Crocker-McElwain Company, a Holyoke-based paper company. He lived here with his wife Pauline and their young daughter Elizabeth, but they had moved out by 1923, and sold the house to attorney Theodore W. Ellis and his wife Gladys. Theodore and Gladys Ellis were still living here when the first photo was taken in the late 1930s, and they were still here during the 1940 census, although they moved to Longmeadow sometime in the early 1940s. Nearly 80 years later, though, very little has changed with the exterior of this house, aside from the enclosed porches in the back and the missing columns in the front. Overall, the house has been well-maintained, and today it is one of a handful of early 19th century homes along this section of Union Street, all of which date back to the days when Springfield’s Methodists had their meeting house nearby. The house at 383 Union Street, at the corner of Mulberry Street in Springfield, around 1938-1939. Image courtesy of the Springfield Preservation Trust. 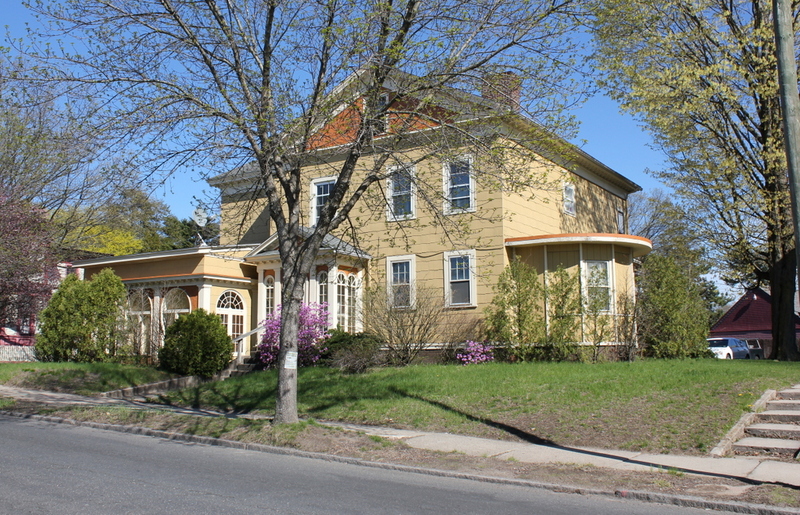 During the mid-19th century, many of Springfield’s upper class residents built fine Italianate homes such as this one, which is located at the corner of Union and Mulberry Streets, on a hill overlooking downtown Springfield. 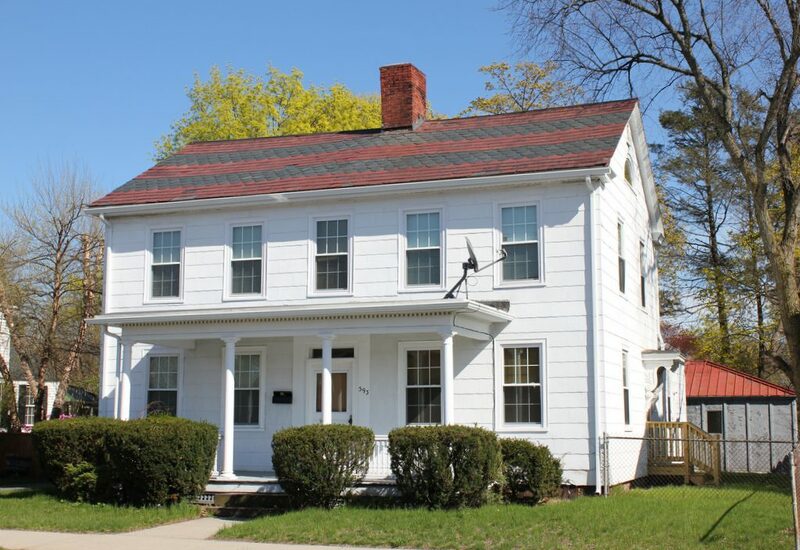 It was built around 1864 for Dr. Varillas L. Owen, a Harvard-educated physician who moved to Springfield in the early 1850s and opened his practice in the rapidly-growing city. He lived here with his wife, Maria Tallant Owen, a Nantucket-born botanist who would go on to achieve fame in the scientific community, particularly with her 1888 work Catalogue of Plants Growing Without Cultivation in the County of Nantucket, Massachusetts. Here in Springfield, she worked at several different schools, teaching botany, French, astronomy, and geography. Along with this, she also served for many years as the president of both the Springfield Women’s Club and the Springfield Botanical Society. The Owens had two children, Walter and Amelia, who grew up in this house. Walter attended M.I.T. and went on to become an architect, and later moved to New York, where he joined the firm of Renwick, Aspinwall & Russell. Among his works was the George Walter Vincent Smith Art Museum, which was completed here in Springfield in 1896. That same year, he became a partner in the firm, which was renamed Renwick, Aspinwall & Owen, but he died only a few years later in 1902, at the age of 38. In the meantime, Walter’s parents continued living here at this house, long after Walter moved to New York. Varillas died in 1897, and Maria went on to live here for the next 10 years, before moving to Long Island to live with Amelia and her husband, Dr. James Sullivan. By 1910, the house was owned by Charles H. Barrows, a lawyer and author who lived next door at 375 Union Street, just across Mulberry Street from here. He apparently used this house as a rental property, because during the 1910 census he was renting the house to Cheney H. Calkins, a dentist who lived here with his wife Alice, their son William, and two servants. The family was still living here in 1920, but by the middle of the decade this house was the home of Frederick H. Clodgo, a salesman who lived here with his wife, Charlotte. They were living here as late as 1927, but by 1930 the city directory listed this house as being vacant. This house appears to have only been sporadically occupied during the 1930s, but around 1936-1937 it was the home of George and Bertha Rand. During this time, they rented rooms to several other people, but they had moved out of here by 1938. 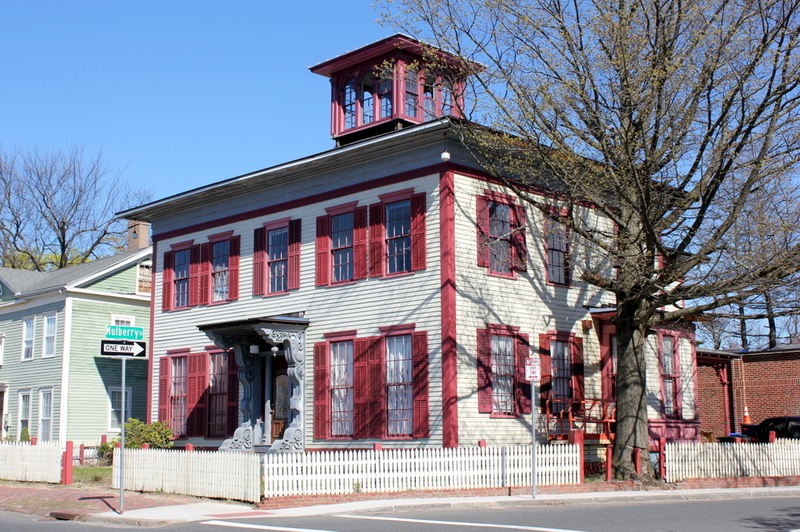 The house appears to have been vacant around the time that the first photo was taken, but it has since been restored, and still stands here at the corner of Union and Mulberry Streets. It is probably the best-preserved example of residential Italianate architecture in Springfield, and it forms part of the city’s Ridgewood Local Historic District.